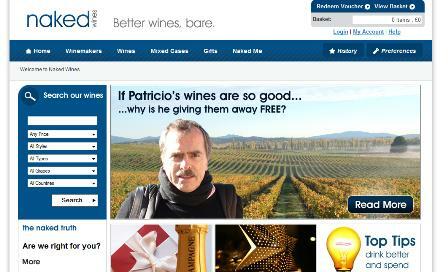 Naked Wines launched this week, offering an alternative model of buying wine online, by connecting winemakers directly to customers. In theory, this will reduce the winemakers’ marketing and distribution costs and allow customers to get quality wines at reasonable prices. So how does the website shape up? Naked Wines has gone for a nice clean homepage design; lots of white and not too much cluttering up of the page with lots of offers, making it easy for the first time visitor to scan and understand it. There is a link to more information about the concept behind Naked Wines, but perhaps the model of buying direct from the growers could be summarised on the homepage to help visitors understand the concept. Customers can search by country, price range, style and grape, and keyword, as well as browsing through the list of winemakers selling through the website. This means there are fewer search and filtering options than some other wine sites, which would be a problem if there were hundreds of bottles and cases on offer. Since Naked Wines has a smaller range from a select group of independent winemakers, theren’t aren’t massive lists of wines to look through, so this isn’t an issue. Using the arrows on the homepage, you can scroll through the winemakers, see pictures of them, and opt to find some more information about them. This is where the site really differs from other online wine sellers, as you can get more of a feel for the people behind the wines and the places they are grown. The checkout process has been kept nice and simple, and it worked well and quickly enough for me. The forms were simple and easy to fill in and there weren’t too many steps to go through before payment. I think it could do with some of the features online shoppers are used to at this stage, such as a progress indicator, links to reassurances about security issues and T&Cs, and perhaps a customer service number for shoppers who have questions at this stage. Some of this information is there on the site if you look for it, but perhaps it should be made more easily accessible for customers on the verge of making a purchase. Also, each winemaker has a Facebook style ‘wall’ where customers can leave comments and the makers can reply direct to comment and queries from customers. The recommendations and direct communication with the wine growers should be very useful features, though this will be easier to judge once the site has been going for a while. The Naked Angels model for buying wine, where customers pay £5 per month to the winemaker in return for a 33% discount, differs from other sites and may not be what the casual visitor expects, so it could perhaps do with more explanation on the winemakers’ pages. There is a general explanation on the page, but customers may have further questions, such as whether they are locked into the deal, or how often they can order, which aren’t answered on this or the shopping basket page. The help section provides a good range of FAQs that answer most possible queries, and Naked Wines provides plenty of customer service contact options, so perhaps links to this information should be available. Also, and perhaps because the site has just been launched, there are a couple of errors. For instance, a link on the homepage promises the ‘Perfect Christmas Selection’ for £39.99, but send users to a page showing a case for £69.99. The site is new, and needs a few tweaks here and there to make it a little easier for customers to use, but it looks very promising so far. It is easy to use and, provided Naked Wines can get enough people participating in the site; filling out profiles, reviewing wines etc, the recommendations should be valuable for the novice wine buyer. As I read the December 8 issue of BusinessWeek on my 20+ hour journey home last week from the United States, I came across an interesting article that discussed a new youth-oriented banking product called ‘Virtual Wallet‘ that was launched by PNC Financial Services (PNC). Where should I put my digital marketing budget? With business trying to work out where they should be spending their marketing budgets, everyone is ready to suggest a channel for them to invest their money.